Last chance: We only have 10 left - This product will not be available again once our stock runs out. The Instant Hair Coloring Gel!! 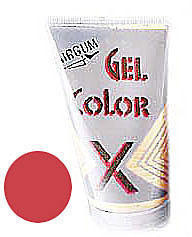 Size (inches): 1.38" X 1.38" X 3.74"
Hairgum Hair Color Gel is fun to apply! And don't worry, the color washes out with your next shampooing!. The great creamy formulation gives you the VIBRANT color effect you need for that next crazy outing! Available in 7 mix-and-match colors: blue, green, purple, red, copper, gold and silver.